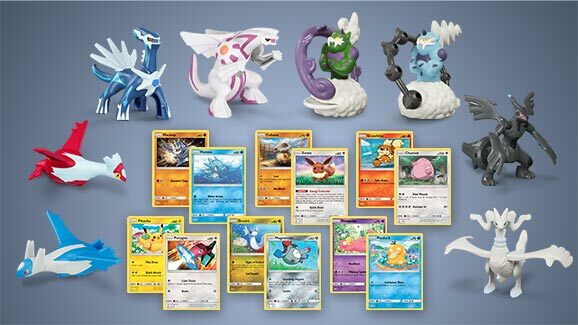 The Pokemon Company and McDonald’s have released a bunch of Legendary Pokemon figures and Pokemon TCG promo cards in the United States. From now till November 12, 2018, all Happy Meal purchases will come with 1 of 12 Pokemon TCG promo cards and 1 of 8 Legendary Pokemon figures. For a limited time, look for Legendary Pokémon figures and Pokémon TCG promo cards in McDonald’s Happy Meals. Something legendary is coming to McDonald’s. Through November 12, Happy Meals at participating McDonald’s restaurants will feature a toy figure of a Legendary Pokémon, as well as 1 of 12 cool promo cards for the Pokémon Trading Card Game. The cards feature a special foil treatment that can only be found in McDonald’s Happy Meals. The Legendary Pokémon-themed Happy Meals won’t be around long, and they’re only available while supplies last. Enjoy the fun of Pokémon the next time you open a Happy Meal at McDonald’s!